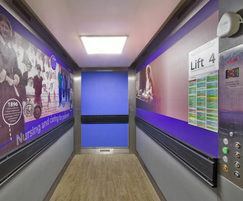 Construction Specialties supplied custom printed Acrovyn by Design® wall panels as part of the Salisbury District Hospital’s lift refurbishment programme. 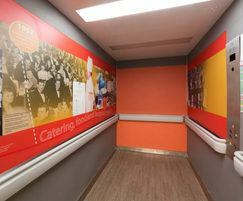 ArtCare, the arts in health service for Salisbury NHS Foundation Trust, designed a scheme which turned passenger lifts into time capsules, using inspiring historical imagery to document the hospital’s history and pioneering healthcare treatments. 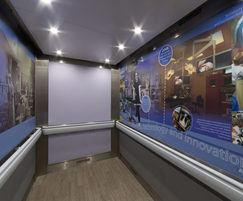 Each of the 6 lifts received a distinct colour and theme, utilising old photos from hospital archives used in imaginative collages showcasing development milestones. The bespoke artwork was incorporated into Acrovyn by Design®, a durable, wipe-clean wall covering which protects both the wall and the image from scuffs and abrasion. 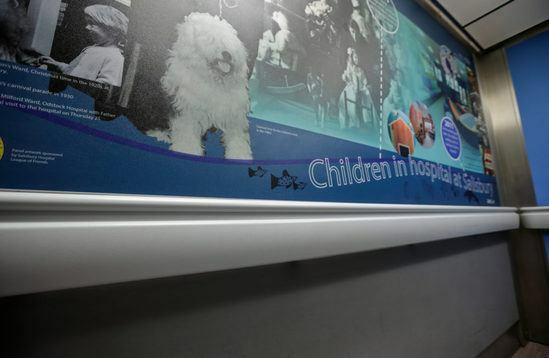 The wall protection scheme also included Acrovyn® Sheet in complementary solid colours applied to the bottom part of the lifts, and robust Acrovyn hand/crash rails fitted at mid wall height for effective protection against damage from hospital beds and trolleys. 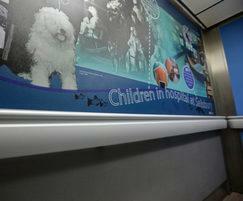 Despite regular and intense use, refurbished hospital lifts are now easy to maintain and are expected to last at least another 20 years.